Jennifer Cohen Harper, MA, E-RCYT is the founder of Little Flower Yoga, and The School Yoga Project, which brings yoga and mindfulness to schools nationwide. 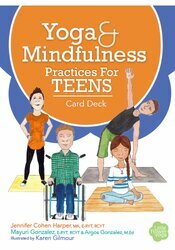 She is the author of Little Flower Yoga for Kids: A Yoga and Mindfulness Program to Help Your Child Improve Attention and Emotional Balance, co-editor of Best Practices for Yoga in Schools, and creator of the bestselling Yoga and Mindfulness Practices for Children Card Deck. Jenn leads yoga and mindfulness teacher trainings nationwide, provides therapeutic classes to children and families, and continuing education to mental health and education professionals. Argos Gonzalez, M.Ed., is a teacher, lecturer, and mindfulness and yoga instructor. He has 13 years of experience teaching high school in the Bronx and teaches pre-service and in-service teachers at Hunter College School of Education in NY. Argos is certified through both Mindful Schools and Little Flower Yoga (LFY), and currently serves as the director of professional development for The School Yoga Project, a program of LFY.